Waxing is the most common method to remove unwanted body hair and create smooth, silky skin. We offer a variety of waxing service to choose from. 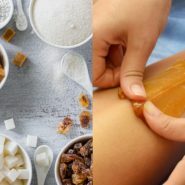 Sugaring – Is an innovative new alternative option to traditional waxing. We can do sugaring on any area of the body just like waxing and it is the same price as waxing.